Casebooks in public administration have become intensely sophisticated with complex scenarios, richly detailed multi-step simulations, and demanding role playing requirements. While these types of cases and exercises have their place, Managing in the Public Sector is a casebook designed with maximum instructor flexibility and student engagement in mind. Featuring cases brief enough to be covered in the last few minutes of a class as well as those substantive enough to last the entire hour, this book allows instructors to illustrate theoretical concepts, encourage active student participation, to make a transition between topics, or to integrate different approaches to administrative study. A cross-listing of all cases and subject matter in an appendix for quick topical reference. 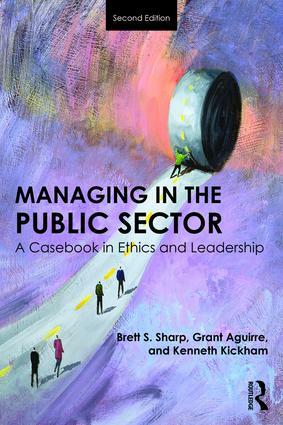 Now even more enmeshed in the literature of ethics, leadership, and public administration, Managing in the Public Sector, 2e provides authentic, hands-on experience of the decisions public administrators must face. It is an ideal casebook to supplement undergraduate and graduate public administration, leadership, human resource management, or administrative ethics courses. Brett S. Sharp is Professor of Public Administration and the Founding Director of Leadership Studies at the University of Central Oklahoma, USA. Grant C. Aguirre is Assistant Professor of Marketing in the College of Business at the University of Central Oklahoma, USA. Kenneth Kickham is Professor of Public Administration at the University of Central Oklahoma, USA.